Crusaders brushed aside the challenge of Warrenpoint Town at the Q Radio Arena on Tuesday night as Paul Heatley helped himself to a hat-trick in an easy win. There was a further goal for Darren Murray and though TJ Murray did pull one back late on, it was never going to be close to enough to deny the Crues a return to the summit of the table moving two points ahead of Coleraine again. It was Stephen McDonnell’s hosts who went the closest in the 18th minute when Sean Mackle’s corner from the left hand side dropped into the six-yard box towards Alan O’Sullivan, but he couldn’t get a significant touch on it and Crues keeper Brian Jensen was able to collect. O’Sullivn then blasted high and wide with his left foot after a powerful run infield three minutes later before the visitors began to take the game by the scruff of the neck and started to open up the men in sky blue. It was former Warrenpoint striker Darren Murray who had the first of a flurry of opportunities midway through the first half when his low shot from the right was deflected out for a corner by Liam McKenna. The North Belfast men deservedly took the lead on the half hour mark. Jordan Forsythe’s pinpoint diagonal ball from right to left set Heatley, who had been quiet up until that point, racing clear on goal and the forward made no mistake with a sumptuous outside of the right boot first-time finish that gave Ton keeper Jonny Parr no chance. Murray only had to wait until five minutes after the restart to finally get his goal against his old club and double the lead for his new side when he cracked in a fine low volley from 15 yards on the right hand side that flew past Parr. 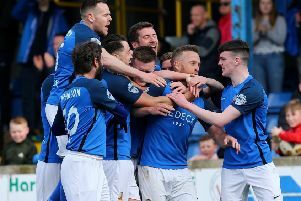 As Crusaders kept forcing the issue in their hunt for more goals, Warrenpoint began to make more mistakes and Parr was lucky on a couple of occasions that he wasn’t caught out after spilling the ball inside his six-yard box. The ‘Point did have two good chances when O’Sullivan burst through but could only shoot wide with the goal at his mercy before Jensen made an excellent stop to deny substitute Conor McMenamin following a Mackle through ball. However, from the resulting corner, Crusaders put the game to bed with a lightning quick counter-attack that led to a brilliant third goal and a second for Heatley and he made it 4-0 after 70 minutes. Warrenpoint did pull one back three minutes from time when Jensen let TJ Murray’s shot from the edge of the box squirm under him.